Randy is proud to have become an intern pastor at St. Peters. 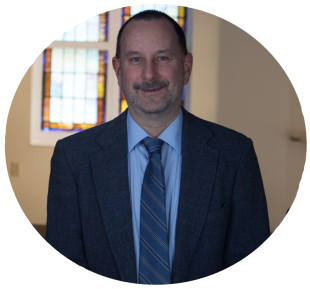 He had his calling to become a pastor at about eleven years old and was influenced by a pastor named Thomas Stennet from Christ Lutheran Church in Millvale, PA. He had been going to that church for most of his life and participated in many aspects of the church. Growing up, he was an acolyte for the early service, which he took great pride in doing. He was also active in the youth group and attended Sunday school all the way through High School. He enjoyed following God and learning about Jesus. Sometime around Randy’s teenage years he decided to experiment with alcohol and got away from the church and God. Randy always knew He was there but never really was ready for Him in his life. That part of Randy’s life lasted 26 years. All of it wasn’t bad, but Randy knew he was missing something important from life. That important missing thing was God and from the help from prayers from his daughter and falling to a really low point of his life, Randy called upon God to save him. ​That day was October 11, 2002. God accepted him back and it has been a great time ever since. He went from having nothing, to becoming the man that God had wanted him to be. Randy has become a better parent, person and husband through the help of God. Currently, he is enrolled at Liberty University and completing his Bachelor’s degree in Christian Ministries. Randy has applied for acceptance for the Master’s degree in divinity at Liberty University and desires to become a pastor of his own church someday. Besides his schooling, Randy had been in the restaurant business since the age of 14. Always wanting to own his own restaurant and God gave him that chance in February of 2007. Randy opened ZTown Café. God tasked and provided Randy the responsibility of the “Feed My Sheep Ministries” and kept it running for the past nine years. Twelve years ago, he started the $1 pasta dinners at HZ United Methodist Church and this dinner has operated continuously for twelve years, only missing one month in all that time. Randy sold Ztown Café as of June, which allows him more time for his studies and church. Randy’s current projects for showing God to others is the Journey and coordinating the community dinners that are held at St. Peter’s. Randy is committed to the ministry with the goal of helping others so they do not have to suffer without God. He is committed to helping others who have addiction issues by leading them to our Savior Jesus Christ. God has graced him with a wonderful wife and her two children, a daughter of his own, who loves and respects Randy again, a beautiful house by the creek (sometimes in the creek) and all needs and many wants fulfilled. Randy likes to fish, bowl, and ride his motorcycle.